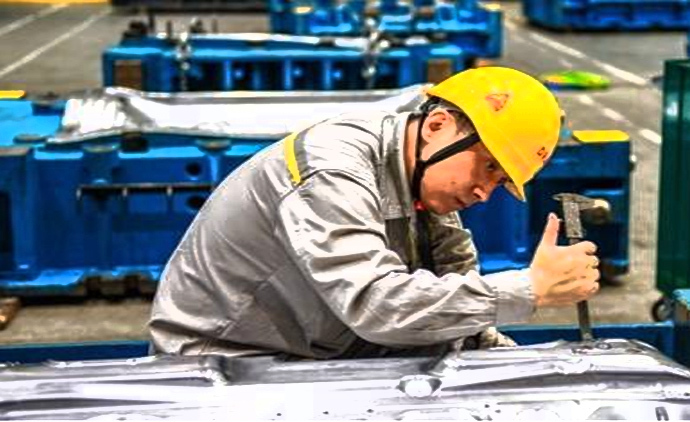 The zone is home to the headquarters of the Dongfeng Motor Corp, which ranks 68th on the Fortune 500 Companies list, Dongfeng Peugeot Citroen, Dongfeng Honda and Dongfeng Renault, and also has attracted world-renowned automotive parts manufacturers, such as Valeo, Getrag and SDS. There are eight companies with annual output in excess of five billion yuan and two companies with annual output in excess of 50 billion yuan, accounting for 27 and 40 percent of the city’s total numbers, respectively. To Peng Yanbin, the equipment in the workshop seems to have come to life. The coordination between electrical principles, industrial procedures and mechanical equipment is like a symphony; adjusting it just makes the melody more pleasant. ​Lian Zhenjun, born in 1976, is a senior technician of automobile maintenance at Dongfeng Honda Automobile Co. The youngest senior technician in Dongfeng Peugeot Citroen Automobile Co Ltd since its establishment, Feng Yang, with his endeavor and diligence, has been appreciated as one of the “most beautiful front-line staffs” this year. The first Top 10 Craftsmen of Chedu (Auto-city) list was recently announced at an awards ceremony of the Wuhan Economic & Technological Development Zone (Hannan), Hubei province.